Rev. 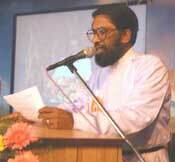 Dr. Ipe Joseph is the general secretary of the National Council of Churches in India (NCCI). The NCCI is the ecumenical forum of the Protestant and Orthodox churches in India. NCCI’s focus is the initiation, promotion and coordination of various forms of ministries throughout India—both in terms of preaching and of service to society. NCCI also serves as a common platform for thought and action and as such it brings together churches and other Christian organisations for mutual consultation, assistance and action in matters pertaining to churches in India.